SCRANTON, PA – January 8, 2014 - Kane Is Able, Inc.has been named to the 12th annual listing of the “2014 Supply & Demand Chain Executive 100” by Supply & Demand Chain Executive Magazine. KANE was selected for the list based on the results it delivers through its retail freight consolidation program for small to mid-sized shippers. This collaborative distribution solution dramatically reduces transportation costs, streamlines load handling requirements, and reduces the number of trucks on the road, creating an economical and green solution. 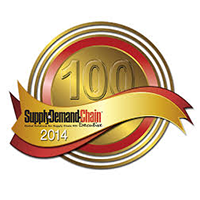 The 2014 Supply & Demand Chain Executive 100 list is comprised of supply chain providers that are helping their customers and clients achieve supply chain excellence. They have produced measurable gains in ROI through cost-cutting and increased efficiency, whether in warehouse management services, transportation, procurement sourcing, or any other category in the end-to-end supply chain. Supply & Demand Chain Executive selected the winners based on the ambitiousness and scope of the project; a creative application of technologies, solutions and/or services; the extent of the business results and/or impact; and the clarity of submission.